Return flights from Switzerland to Bali, Indonesia from €398! Want to visit amazing Iguazu falls, UNESCO World Heritage Site, located at the borders between Brazil, Paraguay and Argentina check out this promotion of Air France-KLM and their local partners. Return flights to Iguazu Falls (IGU) are now available from €417 when departing from Bucharest or from €446 from Prague. Fare is inclusive of all taxes and fees,meals and hand bag. Checked luggage for extra fee. This is very rare deal on these routes so do not miss this promotion if this is a destination you like..
Air France / KLM promotional sale is available when traveling from Europe to Iguazu Falls from 1st of January to 30th of June 2019. Except flights in February. Also latest date of your inbound flight from South America back to Europe. Min stay 7 days and max stay 3 months. This promo offer is valid for bookings made till 20th of December 2018 or until sold out. To check your connection possibilities from your home town we recommend to use Skyscanner. This tool gives you quick idea which low-cost airlines are connecting these cities from your home city. Need affordable hotel in Brazil book your accommodation via Booking.com or Hotels.com. 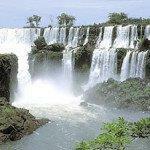 Booking sample of cheap return flights from Bucharest or Prague to Iguazu Falls, Brazil from €417! In this case you would be flying from Romania to iguazu Falls in Brazil on 25th of May 2019 and returning back from South America to Europe on 6th of June 2019.